Mix hot water and conditioner together in medium bowl. (The hot water helps smooth any clumps from the conditioner). Mix in vinegar and pour in container of choice. 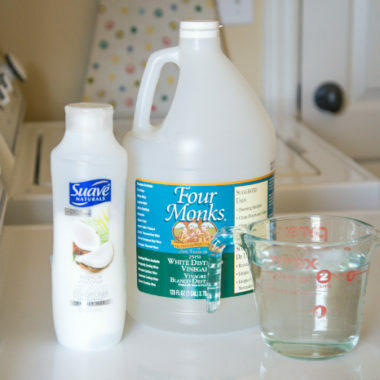 Use the same amount as you would a store bought softener and add to the regular softener spot in your washer or during the rinse cycle. Note: I used a regular cheapo conditioner from the dollar store. The higher quality conditioners won’t make any noticeable differences, so don’t waste your money!